Monday night, I went to watch the Dallas Stars take on the Washington Capitals. Perched nicely in a seat in front of the Jonny Walker suites, I watched most of the beginning of the game. During the National Anthem, some folks in the crowd sheepishly yelled "Stars" at the point of "broad stripes and bright stars", but it was no where near as forceful as the "Red" in the "rockets red glare". This is DC after all, and Caps' fans rock the red in the phone booth to support their team. I watched the first 2 periods of the game and sipped pinot grigio, while I took in the scene. It was a warmer day, and I wanted something crisp to relax. The game started off like it usually does ~ Caps in the lead and by the end of the 2nd period the Caps were up on the Stars 2-0. Ovechkin had two of the goals to end his 6 game scoring slump. Anyway, the 3rd period started and my friend wanted to introduce me to someone. So there I was chatting it up and networking and before you knew it, the Stars scored. Ok - no biggie... Caps were still up 2-1. I continued to yap. Blah blah this, blah blah that... Wait - the Stars scored AGAIN?!?! Um, ok... I thought to myself and told my friend that overtime could be fun and shootouts are even more fun! He'd never seen a shootout before. 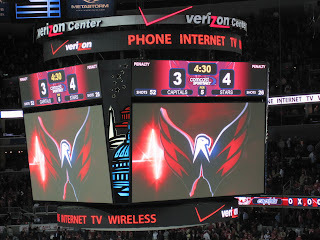 ***I was fortunate enough to witness a shootout at my very first hockey game about 2 years ago, and the Caps were victorious that night. So there we were, tied at 2 in the 3rd period. Next thing you knew Dallas scored and took the lead. What?!?! That wasn't supposed to happen. Late in the 3rd period, Ovechkin netted his 2nd goal of the night and we were tied. I look at the clock and prayed that we go into overtime, tied at 3. I hate when good games end. There wasn't much time left and I watched the clock go to zero. Overtime. Nothing happened, sooooooo ~ we moved to a shootout. Conversation more or less ceased in our suite. Everyone had their eyes on the ice. It was our 5 guys verses their 5 guys. Backstrom was the 2nd Cap to shoot and he scored! The crowd went wild. Unfortunately, 2 of their guys scored, and the Stars claimed the victory. 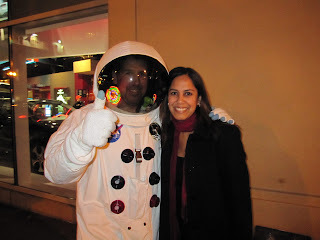 Oh well, on a lighter note after the game, I met the Capstronaut.